This year marks the 50th anniversary of Princess and the British yacht builder has been celebrating in a big way. On top of restoring its original model Project31 and teaming up with Thomas Pink to launch a 50th anniversary collection, Princess has also partnered with Seabob to create two limited edition versions of its popular water toy. Unveiled at boot Dusseldorf 2016, the Lady ’65 and Cubic ’65 feature unique illustrations by Jaume Vilardell and have been designed as the perfect companion to the new Princess 30M, which was seen on sea trials in December. The Lady ’65 offers a more artistic take on the Seabob, with a 1960s style illustration of a sunbathing woman, palm trees and Breton stripes reminiscent of vintage posters of the Cote d’Azur. The Cubic ’65, on the other hand, is a little more understated with sleek grey patterned panels and stylish gold edging. Taking the Seabob F5 S — one of the best water toys for children — as their base, the limited editions are lightweight, highly efficient and small enough to be stored in the garage of even the most compact superyacht. They also promise all the features you would expect of a standard Seabob, including a 40 metre diving range, easy handling and quality performance for both experienced users and newcomers alike. 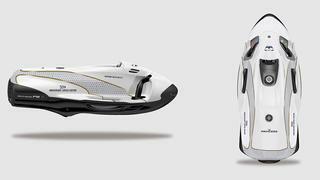 The Princess 50th Anniversary Limited Edition Seabobs are available now priced at €11,255. Visit princessyachts.com for more information.